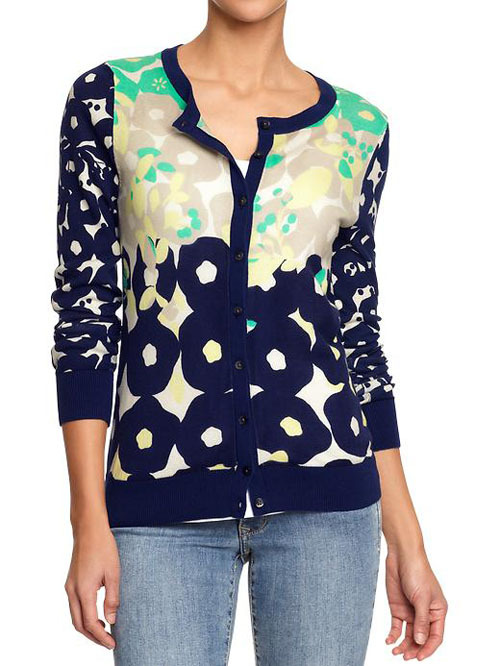 While I was admiring Tory Burch’s Spring 2013 Collection, this mixed print cardigan really caught my eye. 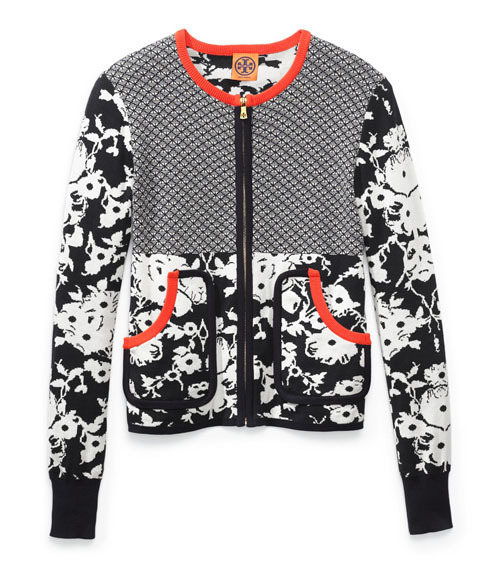 Mixed prints has been a trend on my radar lately; especially with all of the bright prints for spring. So I was happy to find this much more budget appropriate look at Old Navy. I love the Oscars! 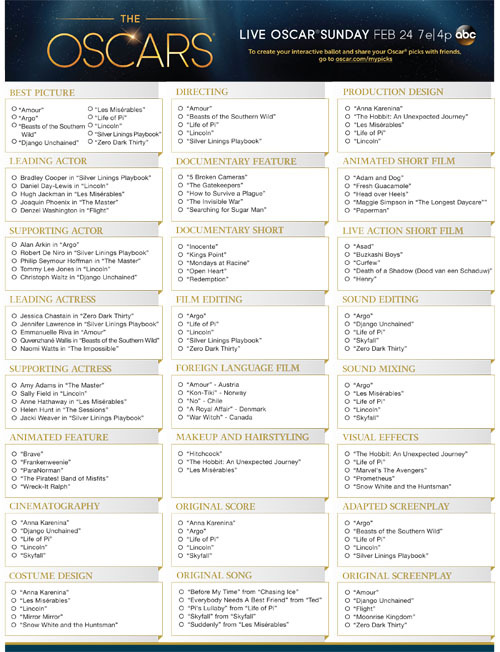 The boy and I watch every year, and we make an honest attempt to see at least all of the Best Picture Nominees — and sometimes even the shorts or some foreign language films. This weekend we will be playing catch up trying to fit in Life of Pi, Amour and Beasts of the Southern Wild. I don’t think we’ve ever been so behind. To get caught up on all of the buzz, and hopefully give myself an edge in his family’s annual ballot race, I have been tuning into NPR’s coverage of the Oscars as well as some other sources. One of my favorite interviews was with comedian Dave Boone, who has written for the Academy Awards eight times. I also love seeing the different red carpet looks, and of course, reading about all of the carnage the next day. I am going to attempt to do some live tweeting while watching so make sure to follow my twitter handle: @cphillis07. And make sure to fill out your ballots! After all of the gray days we’ve had this winter, I want to start incorporating a little more spring in my step and in my wardrobe. 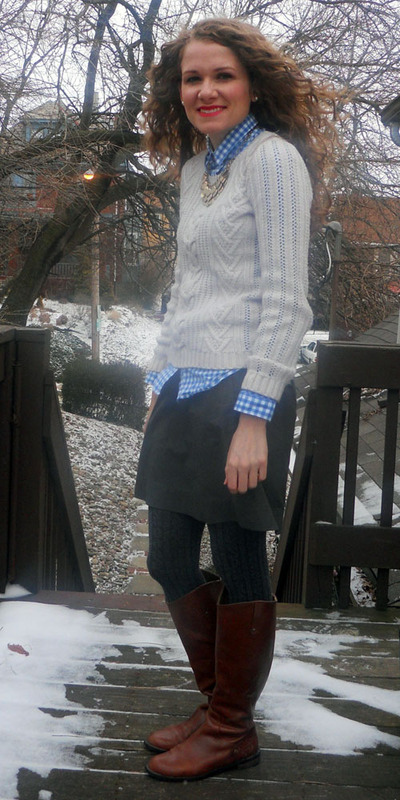 I knew this bright gingham shirt from British retailer Jack Wills would go perfectly nested under my oatmeal sweater. A navy skirt would have been an obvious choice, but it would have made the outfit a little too…well…blue. 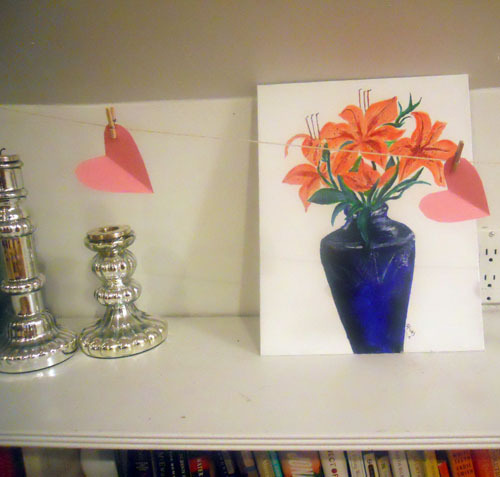 Not to mention my blue tights are hanging in my laundry basket as I write this. 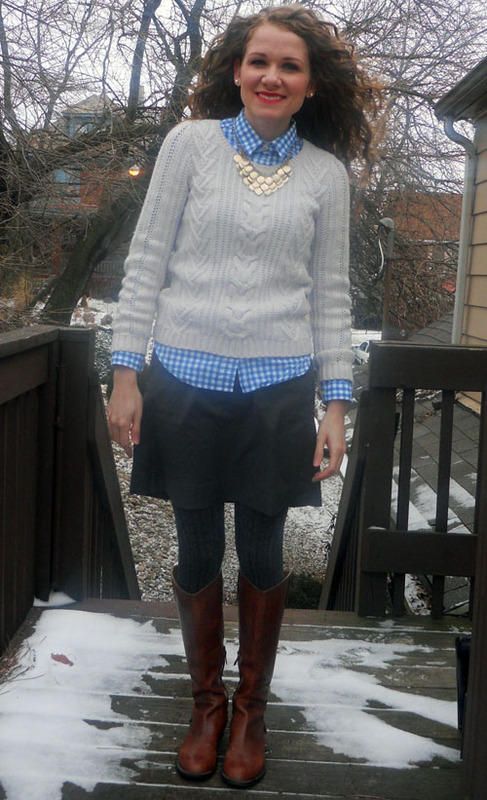 So I opted for a gray skirt and warmed things up with my brown riding boots. I know I am mixing cool and warm colors here, but I like that the boots bring out the warmer tone of the sweater. And also, I don’t care! My gray boots need a visit to the cobbler anyways. 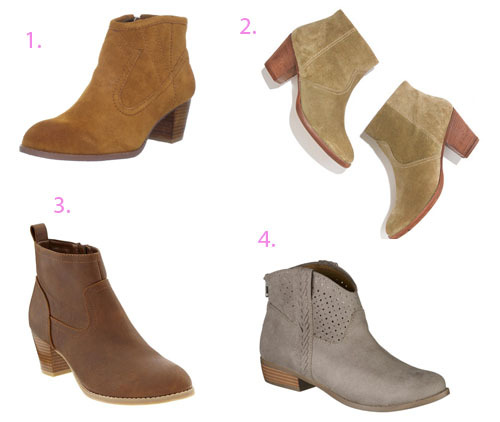 Just looking at these ankle boots, doesn’t do them justice. 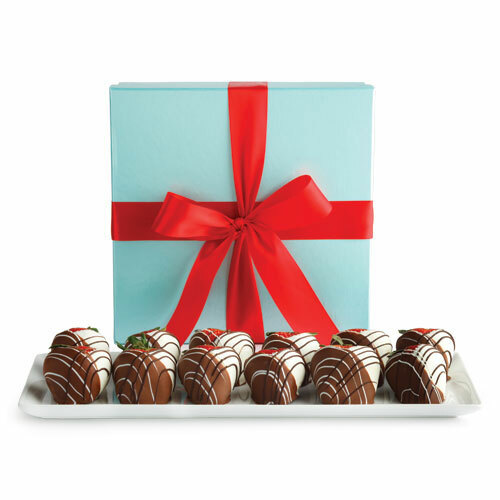 If I saw these in a store, I would likely pass by them without a moment’s hesitation. The cut appears to be unflattering, which might be an issue for someone on the shorter side (is this true?). However, they are starting to grow on me. Actually, I have become obsessed with them. Every time I see the boot on a blog or celeb, its rugged appeal is validated. Its not too late to buy a pair either. They can just as easily be paired with spring dresses as they can with skinny jeans or dare I say, work clothes. 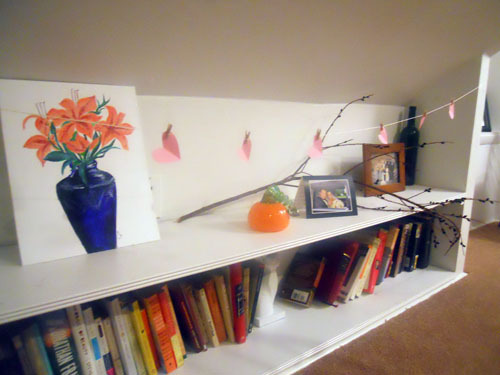 Last minute VDay decor: Paper hearts, string and mini clothes pins. 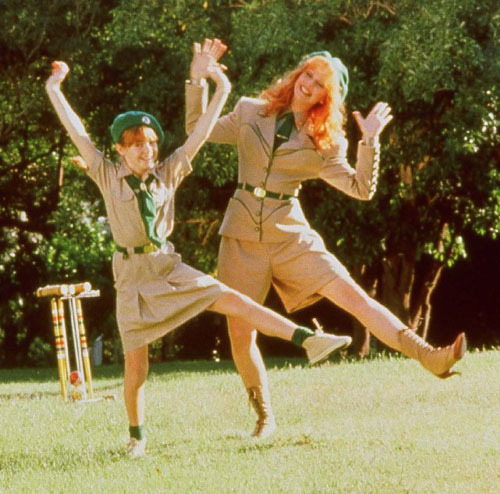 And not watching a romance, but something a little more light hearted, like Troop Beverly Hills. I was born to play that role by the way. 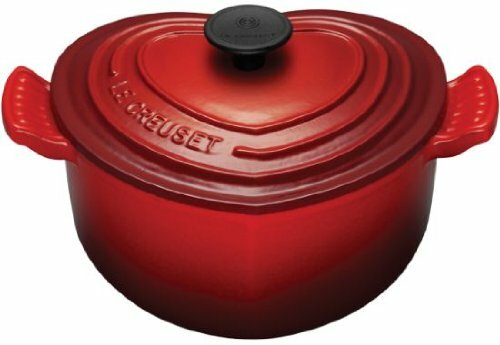 And cooking an amazing dinner in this heart-shaped Le Creuset pot (Amazon, Sold Out!). May need some help with the cooking part. I am still getting dressed over here! Don’t worry about me! It’s just that when there are three inches of snow on your porch and it’s 20 degrees outside, you tend to get lazy about taking outfit pictures. The only thing that has changed since we last spoke is that ever since I saw Beyonce perform at the Super Bowl, I have rekindled my love for Destiny’s Child. Also, did you see how multifunctional her outfit was? This is the perfect segue into why I love this dress. I originally bought this dress when I was asked by my very dear friends to be their daughter’s godmother. It was the perfect level of appropriateness for church and I thought it had the best color palate and pattern for a winter event. Since then I also have found it appropriate for work with it’s high neckline and modest hemline. 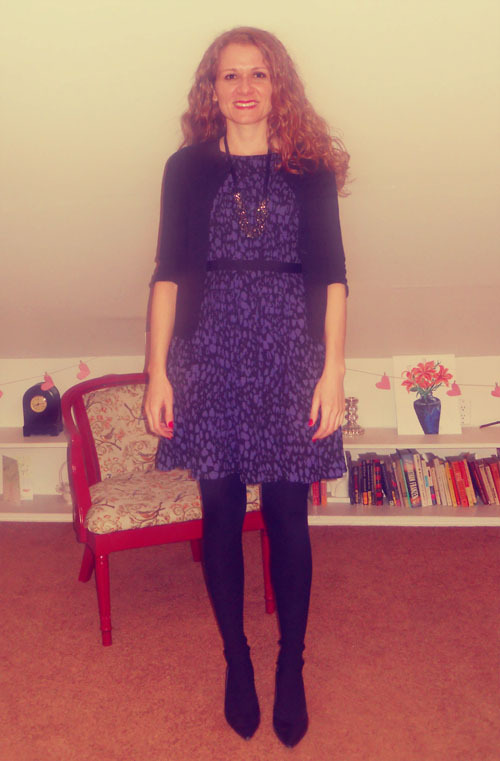 Overall I am getting a lot of use out of a dress that I bought for $27 during the big Christmas eve mark downs.